Nancy Baker, MD, has been a member of the DFMCH since 2001. 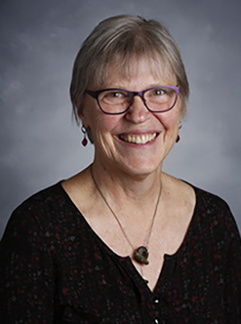 She previously served as residency faculty at the UMMC Family Medicine residency, but is now faculty with the UMN Rural and Metropolitan Physician Associate Program (RPAP/MetroPAP). She oversees the RPAP/MetroPAP community health curriculum and the program’s student COPC projects. She is Past-President of the Minnesota Academy of Family Physicians (MAFP) and is a current member of the MAFP Legislative Committee. Dr. Baker serves on the AAFP Center for the History of Family Medicine Board of Curators and is a hospice medical provider at Our Lady of Peace Home. Dr. Baker is board certified in Family Medicine, as well as in Hospice and Palliative Medicine. She has interest and expertise in teaching narrative medicine and end-of-life care. Dr. Baker is a past recipient of the Robert O. Mulhausen MD Award for Teaching Excellence in Medical Education, the Distinguished Service Award from the University of Missouri Alumni Association, the MAFP Teacher of the Year Award and the MAFP Merit Award. Madlon-Kay D, Ricke L, Baker N and DeFor T. Case series of 148 tongue-tied newborn babies evaluated with the assessment tool for lingual frenulum function.Midwifery, 2008: 24(3): 353-7.Impact factor: 2.281; Sum of times cited: 23; Contribution: I assisted with the manuscript review. Ricke L, Baker NJ, Madlon-Kay D and Defor TA. Newborn tongue-tie: prevalence and effect on breastfeeding. JABFP, 2005:18(1): 1-7. Impact factor: 1.636; Sum of times cited: 149; Contribution:I helped design the study concept, assisted with the study design, data acquisition and interpretation, literature review, manuscript editing and review. Baker NJ, Harper PG, Reif CJ.Use of clinical indicators to evaluate COPC projects.” JABFP, 2002:15(5):355-360. Impact factor: N/A; Sum of times cited: 9; Contribution:I played the primary role in defining the intellectual content of the paper, in data acquisition and analysis and in the manuscript preparation, editing and review. Harper PG, Baker NJ, Reif CJ.Implementing COPC projects in an urban setting – lessons from 10 years of experience. Family Medicine, 2000:32(10): 683-689.Impact factor: N/A; Sum of times cited: 19 Contribution:I assisted with the data acquisition, defining the intellectual content of the paper, and with manuscript review and editing. Culhane-Pera KA, Reif C, Egli E, Baker NJ, Kassekert R. A curriculum for multicultural education in family medicine.Family Medicine, 1997: 29(10): 719-723.Impact factor: N/A; Sum of times cited: 174; Contribution:I assisted with defining the intellectual content of the paper, with the data acquisition and manuscript review. Baker NJ, Reif CJ.Community context for teaching.IN: K. Hamberger et al. (eds), Violence Issues for Health Care Educators and Providers.Binghamton, NY:Haworth Press, 1997.I played the primary role in defining the intellectual content of the paper, in data acquisition and analysis and in the manuscript preparation, editing and review. Baker NJ, Mersy DJ, Tuteur J, Cline M.Family Violence.AAFP Home Study Monograph Ed. 205.Kansas City, Missouri: AAFP, June 1996. I played the primary role in defining the intellectual content of the monograph, in selecting contributors, authoring sections of the monograph and in the overall manuscript editing and review. Dr. Baker serves as a delegate of the East Metro Chapter of the MAFP and has been an advocate for firearm safety on the MAFP Legislative Committee and within the Minnesota state legislature.She has been a small group leader for the UMN “Healer’s Art” course and currently participates in a local Rachel Naomi Remen “Meaning in Medicine” group, whereby a group of community medical providers meets bi-monthly to discuss issues of personal and professional relevance to healers and patients.